Magpies are known for collecting odd bits of this and that. References to familiar fairy tales, and folklore in general, add a richness of cultural beliefs to stories. Michael Aislabie Denham, who died in 1859, was a collector of folklore, a native of Yorkshire. 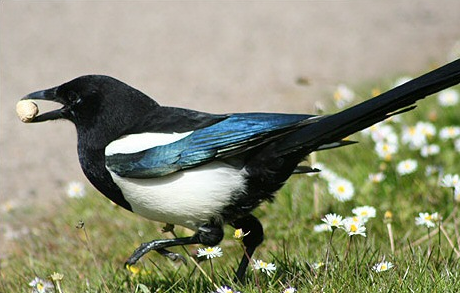 One for Sorrow is a traditional children’s nursery rhyme about magpies (or perhaps crows). According to an old superstition the number of magpies one sees determines if one will have bad luck or not. It has a Roud Folk Song Index number of 20096. P. Tate, Flights of Fancy: Birds in Myth, Legend, and Superstition, New York: Random House, 2010. 1. 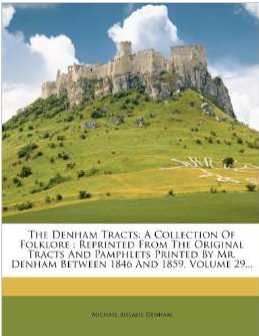 James Hardy, ed., The Denham Tracts: A Collection of Folklore by Michael Aislabie Denham. London: Folklore Society (1892). 2. Michael D.C. Drout, ed., J.R.R. Tolkien Encyclopedia: Scholarship and Critical Assessment, Routledge (2006), p. 121. 3. I. Opie and M. Tatem, eds, A Dictionary of Superstitions (Oxford University Press, 1989), pp. 235-6. 4. J. M. Marzluff, A. Angell, P. R. Ehrlich, In the Company of Crows and Ravens (Yale University Press, 2007), p. 127. Today’s Assignment: Add a bird with mystical attributes to your writing today.